The summer before, a friend of mine had found a good size hen of the woods. She showed it to me, and I convinced her to let me make a wild mushroom lasagna with it. The dish was a hit. I tried to remember exactly when that had transpired, but I wasn’t able to recall when she found that mushroom. I did remember that it was cool, however. At home, I consulted Google, and ordered “Edible Wild Mushrooms of Illinois” from Amazon. Happily, I learned that the season for Hens wasn’t yet upon us. I had a few weeks to wait. The following weekend, when I went to check in on my horse, I took a walk through the woods. I noted dead and dying trees. My pulse quickened. I also saw a lot of nettles, burrs and poison ivy. Ugh. The next few weeks were dry, and hot. Not a single fungus was to be seen, aside from a lichen here and there. I continued sallying forth, teaching my eyes to distinguish patterns on the forest floor, and to pick out lichens. 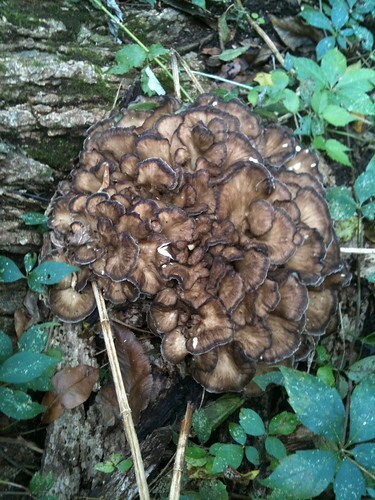 This entry was posted in edible wild mushrooms and tagged hen of the woods, maitake. Bookmark the permalink. Very Nice Find! Good year for Hens. I found close to 80 lbs this year in Maine. Best of all you really don’t have to try very hard to find them here in the state. If you have Extra – Saute in Butter, add 1-1 1/2 teaspoon Honey, 1-1 1/2 Teaspoon worcestershire sauce, let simmer until thickened, dash, salt and pepper. Serve with rice. thanks for the tip, Dave, that sounds like a nice recipe! I’ll give it a try! I did check out your whole Blog being a long time Weekend Mycologist (35+ Years) Found it interesting. I also Teach people the Good from the Bad. I see your concern about the Parasol, but it is so worth learning. One of my favorites. Another favorite is the Mousseron -(Marasmius Oreades). The Flavor is like no other. And like yourself I only stick with the safe ones. Morels, Hens, Black Trumpets, Chanterelles, Fairyring (Mousserons) Oysters and Parasols.